San Diego State is beating up on their opponents and they are currently the highest ranked team in the “Group of Five”. There are not a lot of other teams having as good a season as the Aztecs, so they should clear their schedule for the first day of 2018. USC lost its first game of the season, they faced their toughest challenge of this season by traveling to Washington State on Friday night. The Cougars got a late win over the Trojans, and Darnold struggled in the game and he is dropping in the draft rankings. The Pacific 12 North will come down to the Apple Cup between Washington and Washington State again. Washington is currently undefeated and in the Top 10, but Washington State will have a chance to beat the Huskies and play in the Pac 12 title game later this season. Clemson was on the road at Virginia Tech on Saturday night for the feature game of the week. The Tigers blew out the Hokies and passed another big test early in the season. The only remaining big games they have left in the regular season are against Florida State and then the ACC Championship game, there is a really good chance that the Tigers will be undefeated going into the Playoffs. The next three observations are about the conference that refers itself as, “The Best Conference in College Football”. The conference is top heavy and the only good teams in the conference are Alabama and Georgia. The two teams will play in the championship game, but the team that will finish third in the conference can possibly can have four losses. LSU paid Troy a lot of money to come to Death Valley for Homecoming. The Tigers wanted the fans to go crazy and cap off the weekend with a win, but it did not work out for them. Troy defeated the Tigers to spoil their party. There are already reports that Coach Ed Orgeron’s seat is getting hotter by the minute. Number 4- Should Alabama rest its starters for the Playoffs? 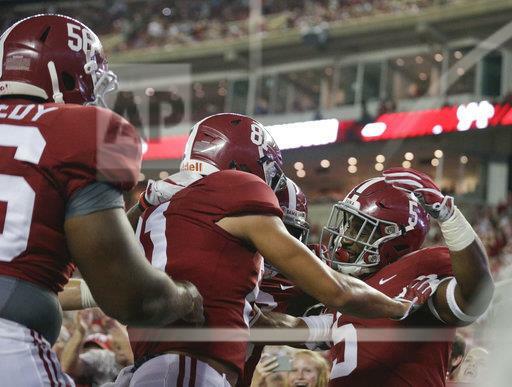 Alabama blew out Ole Miss, a team that has given them troubles in the past. I would be shocked if Alabama loses a game before the Playoffs. I would consider resting their players in the regular season, because their second string players are better than most starters on other teams in the SEC. The conference has four teams ranked in the Top 10, one of them was on bye this week, while the other three had huge wins this week. I will have more on Ohio State down below, but Penn State and Wisconsin are undefeated and lead their divisions. Michigan is still undefeated and there is a chance that the Big 10 championship game will feature two undefeated teams. Oklahoma State has one loss on the season, but still controls its own destiny. The Cowboys are decent and will have a chance to beat Oklahoma to win the Big 12. So lookout for the Cowboys for this season. Talk about Click-bait. The Scarlet Knights got murdered by Ohio State on Saturday but only lost by 56 points. They lost 58-0 last season, so they are slowly improving and maybe in like 20 years they will be able to beat the Ohio State.